Content Objective: I will be able to create an argument to support a claim by editing my first draft of my persuasive speech so that it meets the rubric requirements. Language Objective: I will capitalize every sentence and each proper name. ​Homework: Prepare to present your speech on Thursday. Do Now: Get your laptop. Open your essay in Google Classroom. 1. You will be creating a persuasive speech and presenting it to the class. This will be due Thursday 2/25. ​2. Click here to see an example of an outline for a persuasive speech. Use this outline to plan your speech in your composition book. 3. Click here to go to Actively Learn to see an example of a student's persuasive speech. 4. 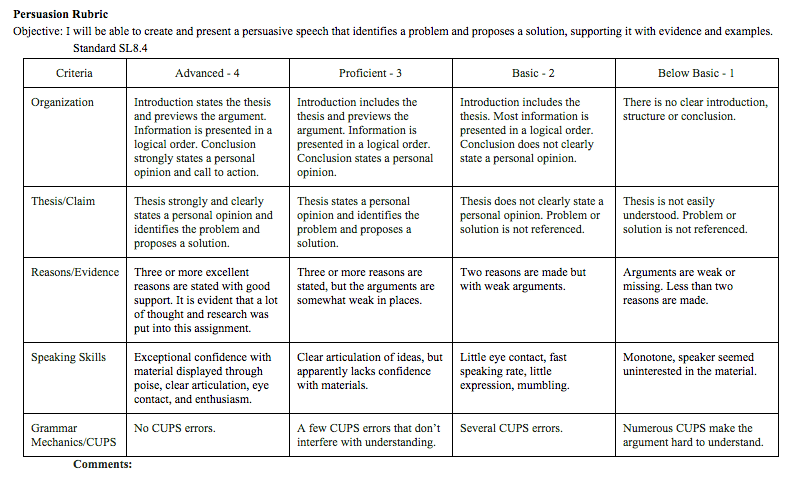 Below is the rubric that will be used to grade your speech. Use the rubric to plan your speech accordingly. 5. Here is a link to our list of Good-Writing Terms. Use at least one per paragraph. 6. Use your outline to begin typing your first draft on Google Classroom. 7. If you submitted your first draft on Thursday, Mr. Westrup has read it and given you feedback. Use the feedback to help you revise your first draft. 1. If you have finished your first draft, use the questions below to help you revise your first draft. If you are not sure how to answer the question, you can ask Mr. Westrup for help. 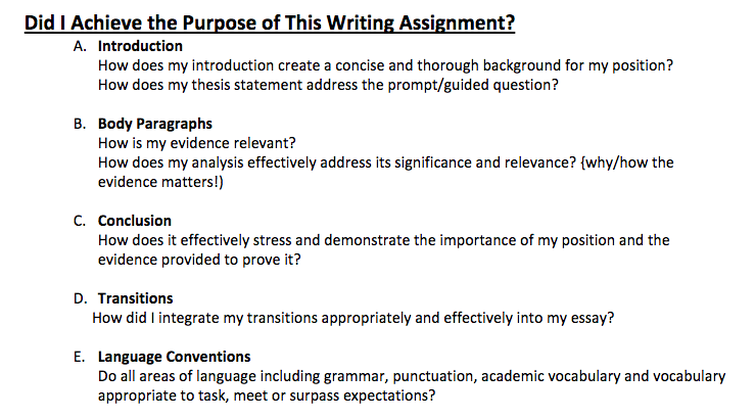 These questions will help you understand which elements of your essay you need to revise. Share your essay with another student and have them give you feedback comments - 3 Glows (what the essay does well) and 2 Grows (what needs to be improved in your essay. Use color coding to identify the elements of your essay. Click here to see instructions for color coding. 3. 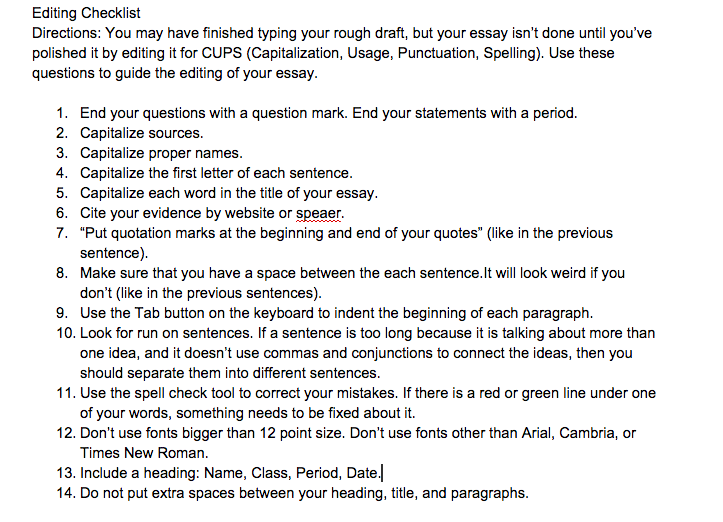 When you have completed #2, you can then revise your essay based on your partner's feedback or your color coding. Exit Slip: Publish your essay in Google Classroom. If you are already done and class is not over, go to Achieve3000 at read the article "What's the Scoop? Ask a PR Specialist." After, you may do Independent Free Time.